A few words about each of the provinces. At the end of the 15th century the Burgundian empire started to fall into aparts. (read: Średniowiecze). The southern parts (today Belgium and Luxembourg) and the northern part (the present Netherlands) grew after that, step by step, further and further apart. The northern Netherlands were at that time hit by floodings (as the St. Elizabeth flood). As a result, poverty created large lot especially religious discomford with the (Catholic) government, among the population. For those reasons the northern provinces worked, step by step, closer and closer together against the Catholic authorities. Which finally brought the States of Holland, in their meeting in Dordrecht, to deprive the Spanish king from the “count’s rights” and gave them in the hands of the States-General in “when assembled in meeting”. Six other provinces joined them in that. Those provinces were united as the seven Dutch provinces. 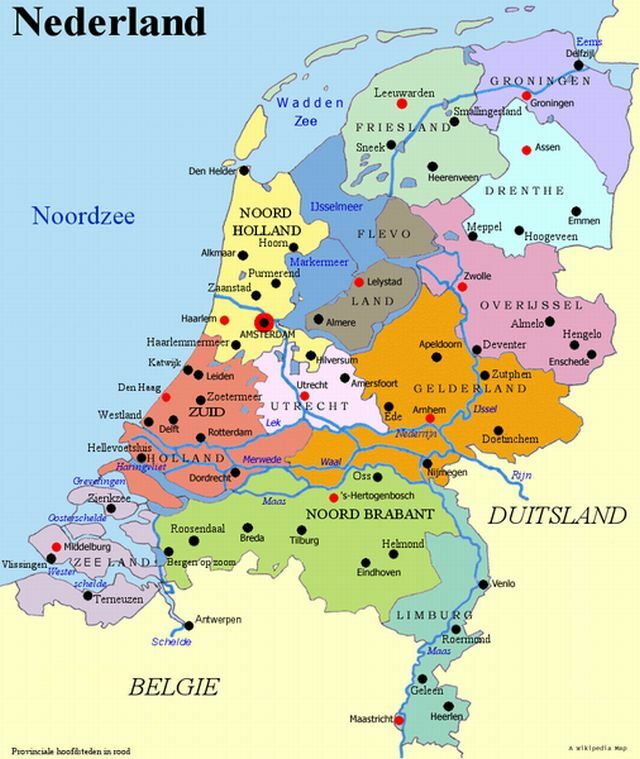 Therefore, most Dutch provinces have a counts crown (which Holland had ceded to the States-General). They also have on their coats of arms the “lions of Holland” as “supporters”. In the southern Netherlands (now Belgium and Luxembourg) where the Calvinists as first ones got organized, the Roman Catholic church remained dominant and thus was opposing the Catholic government there restricted. Thus grew the north (now the Netherlands) and the southern provinces (now Belgium and Luxembourg) still further apart. So many calvists there left home for Holland. So in this paragraph (Structures) a greatly simplified attempted is made to explain the complex structures that, after time, emerged from these developments. These are the structures that made the Dutch a happy nation again. In the paragraphs about the Dutch provinces, the history of each of them is very briefly summarized. Here also is made use of links to show differences in local languages and cultures.